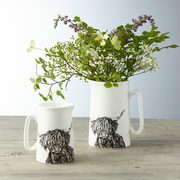 A 2 pint Bone China Jug featuring, Bonnie, the Highland cow. 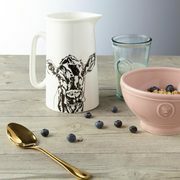 A jug is a must have for any country home! They’re a beautiful vase to display flowers, tidy kitchen utensils or in Lauren’s case paint brushes, as well as serve your milk! Whats more, she's microwave and dishwasher safe! Hand decorated in the UK.